Have you ever poured a large glass of vodka and wished it didn’t look like water? Have you ever wondered why vodka tastes like nail polish remover smells, and wanted to do something about it? Here is the answer to all of your problems. Rosé vodka. Yes, that’s right. Rosé. Vodka. Just what you always wanted! Rosé vodka isn’t just pink vodka—a possibility I hadn’t considered but now think that I would prefer—it’s actually a weird and unholy marriage of actual vodka and wine. Bon Appétit got their hands on this mess and said that it actually tastes like “rosé with higher proof from vodka, or vodka watered down slightly with rosé,” with a slight “bubble-gum” aftertaste. I gladly enjoy rosé even in its off-season and despise vodka; making the latter pink and less barf-inducing by mixing it with the former is NOT a solution for others who share my tastes. Hangar One, the company that makes this abomination, calls it a “great alternative to wine.” Extremely sorry to ask this question, but how is vodka mixed with wine a wine alternative? Is it not an entirely different alocholic beverage? 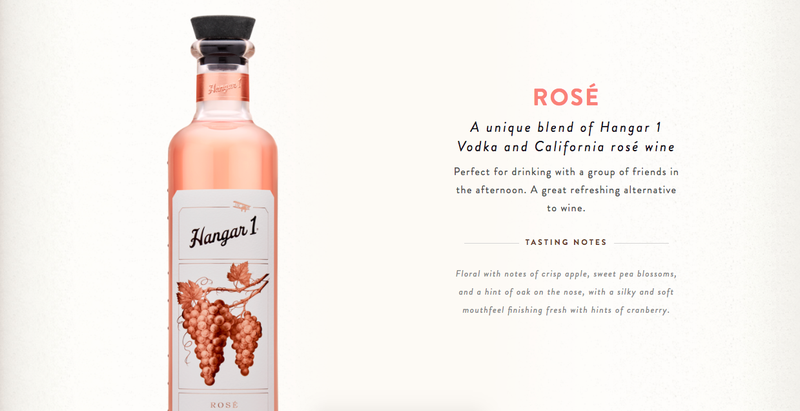 If you want a glass of wine, but you don’t really want a glass of wine, would you turn to rosé vodka, a higher proof version that tastes like vodka with a rosé float? No! You’d drink a sparkling apple juice, maybe, or perhaps my mortal enemy, lambrusco. Or you’d do like a former boss of mine once did, and make a refreshing “spritzer” that was equal parts Franzia White Zinfandel and fountain Sprite in a large to-go cup, with a lot of ice. Whatever! If your commitment to a pink drink is such that you’d consider this, why not turn to Nuvo—the sparkling pink liqueur that was featured prominently in rap videos of the early aughts and looks like a perfume you’d find at a Limited Too? Ooh, retro. So chic. Just miss me with this “rosé vodka.” Thank you!